While many people look forward to warmer weather after a cold, harsh winter, the change of seasons also brings with it a risk of tornadoes. Over 1,000 tornadoes were reported in the United States in 2016, with about 30% of those occurring in so-called “tornado alley” in the central states. Tornadoes form quickly, giving you less time to respond than for other disasters like snow storms or hurricanes. Here are some things you can do to protect yourself, your loved ones and your property this tornado season. Perhaps the best tornado safety tip of all is to be prepared ahead of time, before severe weather approaches. Know the difference between a watch and a warning. A tornado watch means a tornado is possible. A tornado warning means a tornado has formed or is imminent. Know tornado warning signs. Conditions are favorable for tornadoes if you see a dark, greenish sky with large, low-lying clouds, especially if they are rotating. Be alert for large hail and a loud roar similar to a train. Build a safe room. Located in a basement, interior space or garage, a safe room is built to withstand high wind and flying debris. It must be securely anchored and able to resist tornado-force winds. Protect your home. Identify items to bring inside during severe weather, and remove weak or damaged tree limbs so they don’t become flying debris. Install sturdy garage doors and consider permanent shutters that can be closed if a storm is approaching. Stay alert. Familiarize yourself with local emergency policies. Learn about disaster plans at your school or place of business. Make sure you have access to NOAA radio or other media sources for emergency broadcasts. Seek shelter. A basement or safe room is always the best place to be during a tornado. If you can’t go underground, an interior room on the lowest floor of the nearest building is your next best option. Your goal is to put as many walls between you and the tornado as possible. Never try to outrun a tornado. If you’re in your car, buckle your seatbelt and cover your head. If you’re outdoors and cannot make it to a building in time, go to the lowest elevation you can find — such as the bottom of a hill or ditch. Don’t seek shelter under a bridge or overpass, as these may collapse. Evacuate mobile homes. No mobile home is safe during a tornado. Take shelter on the lowest floor of the nearest sturdy building. If you cannot get to a building in time, take cover in a low-lying outdoor area such as a ditch. The danger doesn’t end when the storm subsides. Here are some guidelines for the aftermath of a tornado. Stay tuned to emergency media sources. Don’t leave your shelter until official sources confirm the tornado has passed. If you’ve evacuated from your home, wait until authorities tell you it’s safe to return. If you’re trapped. Tap on walls or blow an emergency whistle. Avoid yelling so that you don’t inhale dust or debris, and cover your mouth and nose with a cloth. Check for and treat injuries. Seek medical attention immediately if necessary. Notify loved ones that you are safe. Contact them by phone, or mark yourself safe using the Red Cross website, Facebook, or other online sources. Inspect property damage. Take photographs to document your losses and immediately contact your homeowners insurance provider to file a claim. Pillar Insurance wants you and your family to be safe this tornado season. 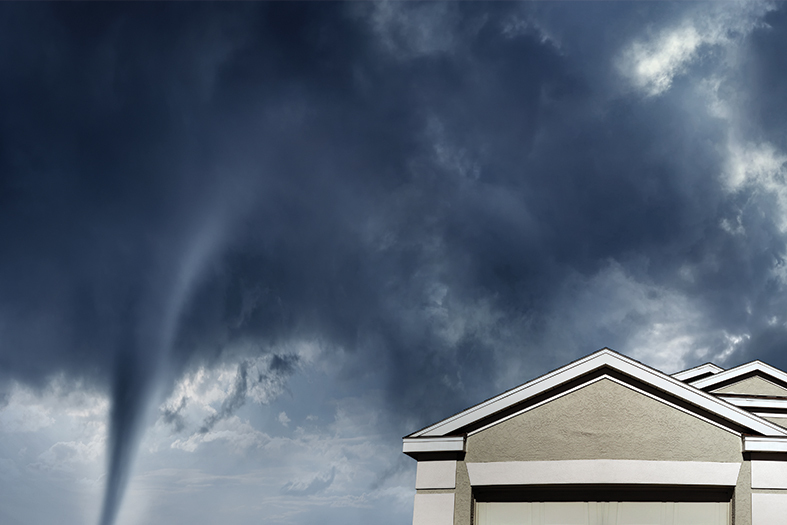 Contact us to learn more about tornado safety and to make sure you have the homeowner’s insurance you need.